I’m on lots of recipe email lists. I mean LOTS. Most of them get opened, gawked at, then filed away never to be seen again. This one, however, got special treatment – when this email arrived, I opened it, gawked at it, realised I had all the ingredients in my cupboard, and immediately went into the kitchen to make it. We were eating it for afternoon tea that same day. Love that! 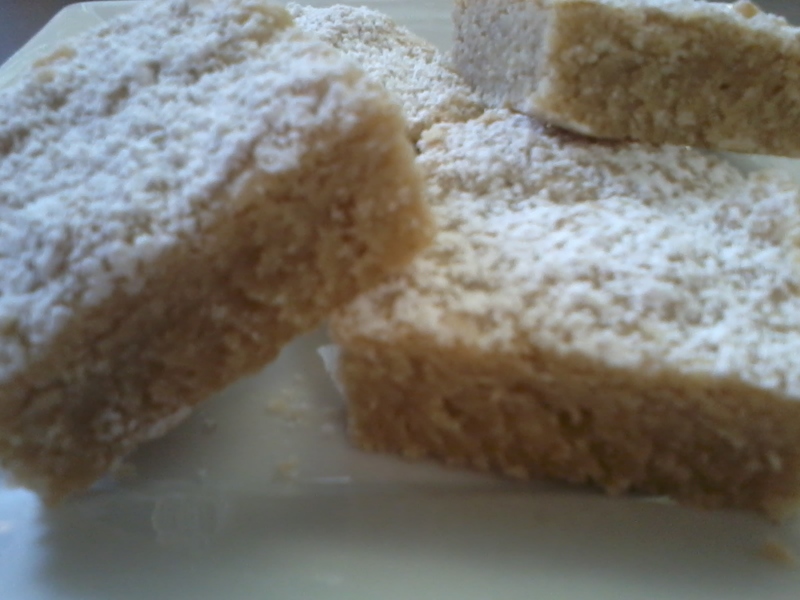 So without further ado, I present to you… Coconut shortbread with cardomom! Mix together the flour, cardamom powder, and salt. Cream together the coconut oil and the powdered sugar with a hand mixer or in a stand mixer until it’s soft and fluffy, about two minutes. Add the flour in three batches, mixing well with a spatula after each addition. Cover and refrigerate the dough for 15-30 minutes. Grease an 20cm x 20cm glass baking pan (I used a round one, worked fine). Place the shortbread dough in the pan. Press with your fingers into an even layer all the way to the corners of the pan. Bake the shortbread in a preheated 150c oven for 50 minutes or until it is slightly darker at the edges. Cool thoroughly and then separate into diamond shapes.